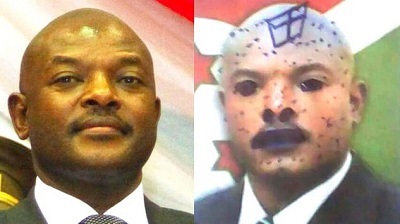 Three schoolgirls in Burundi risk being jailed for five years for scribbling on President Pierre Nkurunziza’s photo in their textbooks, says campaign group Human Rights Watch (HRW). HRW director for Central Africa Lewis Mudge said the father of one of the girls said on Saturday they were “too scared to eat”. Mr Mudge added: “With so many real crimes being committed in Burundi, it’s tragic that children are the ones being prosecuted for harmless scribbles. In 2016, intelligence officers in Burundi arrested eight secondary school students and accused them of insulting the head of state after they drew and wrote phrases like “get out” or “no to the third term” on a picture of Mr Nkurunziza in a textbook. Hundreds of children from several schools were also expelled the same year for defacing the head of state’s photo in schoolbooks.